What looked like icebergs jutting out of the water here and there were actually mounds of 'sea' foam. The breeze piled it up along west edge of the Jetty. I had to taste it to believe it. After I worked on my farmer tan, I made a salt angel. Jen poses on the big rusty buoy between the Jetty and the old pier. This is a fun place for photos. 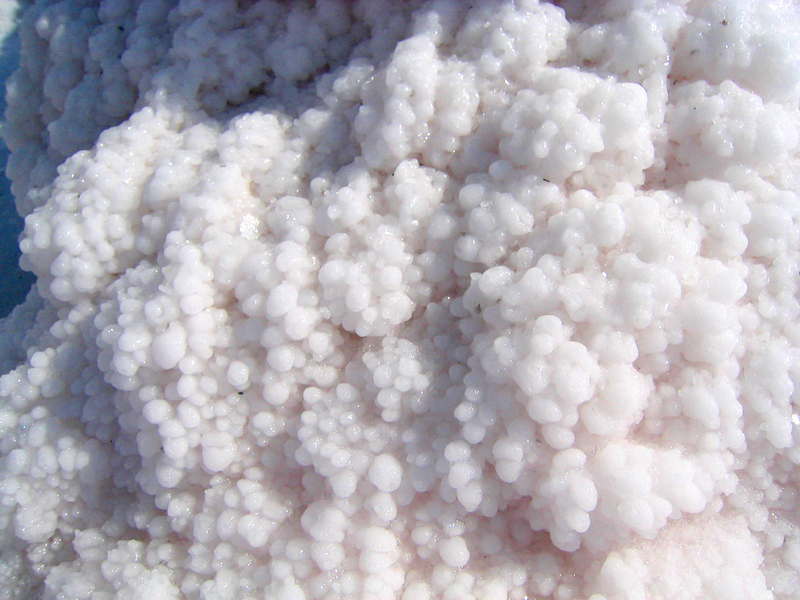 In some places the salt is shaped like droplets, not sharp crystals. I could spend all day just gazing at the clouds. You feel like you're in the clouds because of the cloud's reflections on the water and the bright, salt-covered shore. It's very relaxing. Getting down on the 'stem' of the Jetty, I realized it's a lot bigger deal than I had imagined. 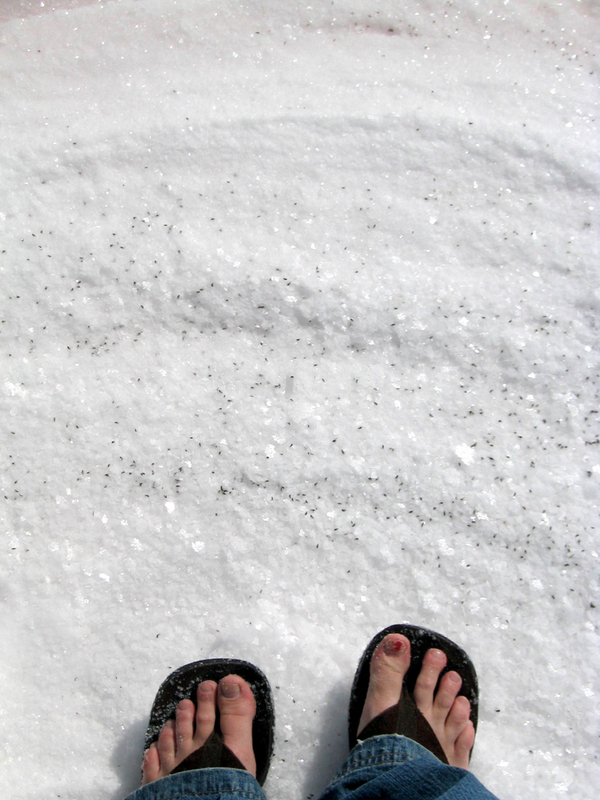 I removed my sandals to feel the salt between my toes. It appears to be a white, sandy beach. 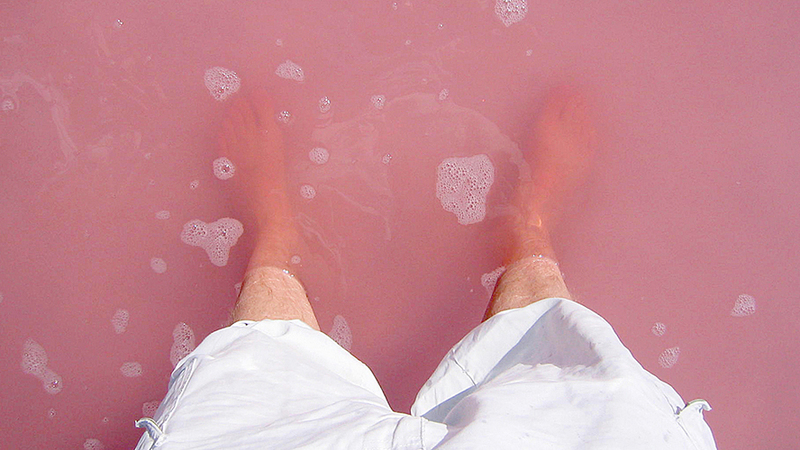 You can't look at pink water without wading around in it. 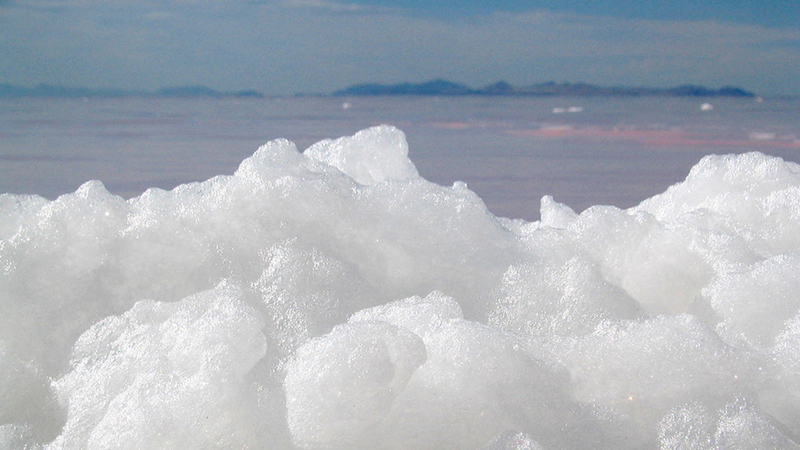 Careful, the salt crystals on the lake bed are super sharp. Best wear your sandals. Walking out into the pink void. Is this a dream? The wind sheared my foamy beard. Friends, map, sunglasses, plenty of gas and water, camera, phone, sandals, shade and lunch. Getting there: The bumpier the road, the closer you are. When it's impossible to go any further, take a look toward the lake, chances are you've arrived. Make time to visit the Golden Spike National Monument. Catch the reenactment of the ceremonial driving of the spike every Saturday and holiday from May Day to Labor Day. Be Prepared: Check the weather, Gas-up your vehicle and charge your phone. Once there, lock your doors, and beware of lightning storms. Weather changes rapidly on the lake. Your Results may vary: The Jetty is in constant flux depending on weather, lake levels and salinity. This 'entropy' is what the artist intended. No matter when you visit, it's sure to be an oddly memorable experience. Be sure to check out the remains of an old wooden pier just a few hundred yards to the south. It's a popular spot for photography. And look for the massive rusty buoy half-submerged in the salty sand. I'd been hearing about the Spiral Jetty for as long as I could remember and like most, I never quite understood what or where exactly it was or why it existed. All I knew was this: it was a spiral-shaped creation in a remote area of the Great Salt Lake, created by some wacky artist in the ‘70s. I figured it was a prime gathering place for hippy types to tie-die, meditate and whatever else hippies do. 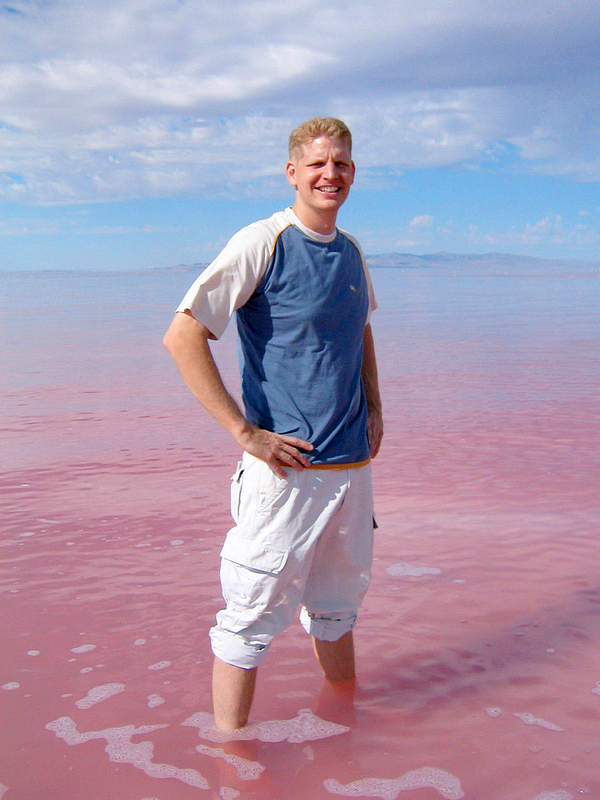 In 2002, the Jetty made local headlines when the steadily receding shoreline of the Great Salt Lake revealed the once submerged formation, making it accessible by foot for the first time in over 15 years. 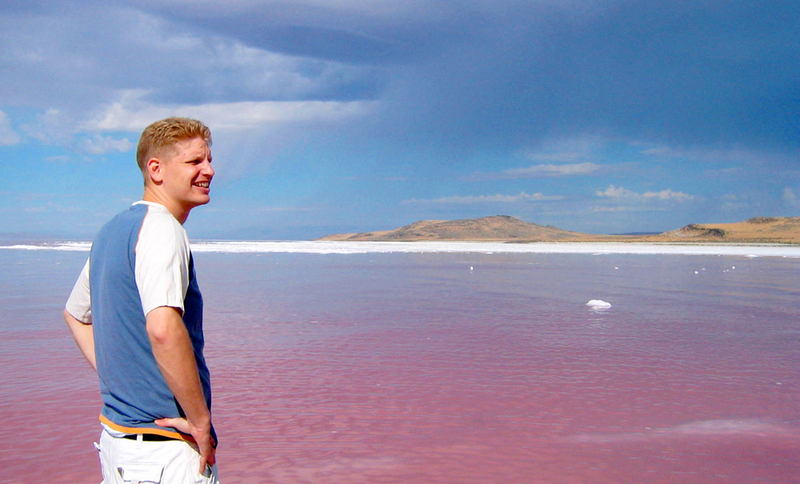 In 2006, a friend was given the assignment to "Experience the Jetty" for a college art class. Since I was studying art and design and because the Jetty was in the middle of nowhere, she invited me to come along. 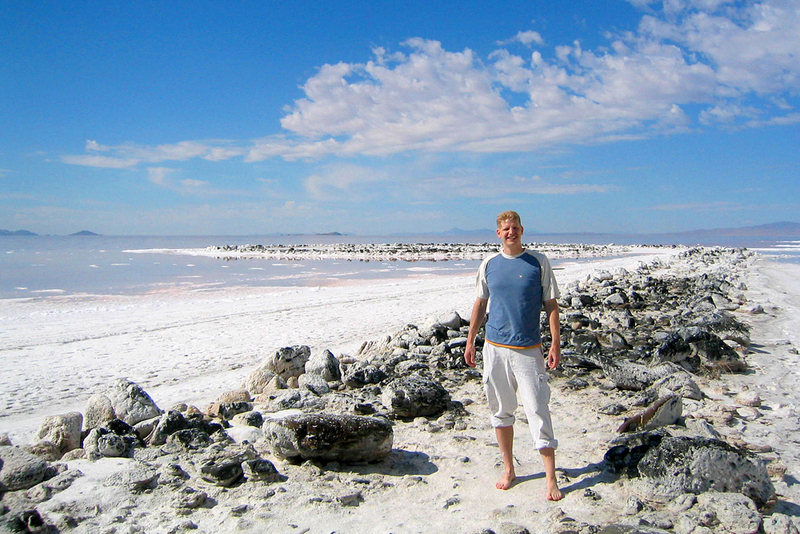 "Sure", I said, deciding It'd be a great opportunity to find out what this Spiral Jetty phenomenon was all about. We struck out on a Saturday morning in September following a xeroxed, hand-drawn map provided by her professor. Luckily, I did some internet research the night prior and familiarized myself with few of the landmarks along the way - the most obvious being the Golden Spike National Historic Monument where the 'Wedding of the Rails' occurred in 1869. From there, the way is now clearly marked by a number of signs. While driving, we joked about her professors words: "Experience the Jetty" -as if it were something more than a silly spiral-shaped pile of rocks in the Great Salt Lake. If anything, I was preparing to experience disappointment. 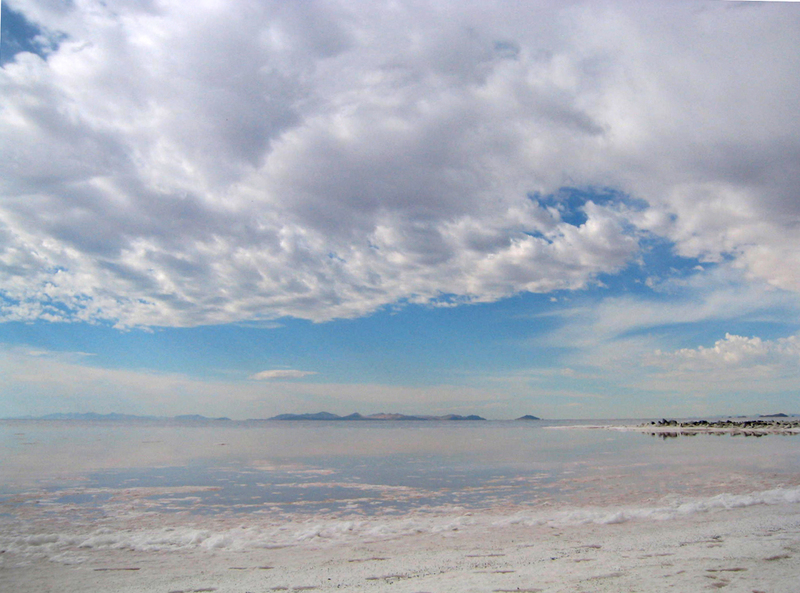 For the uninitiated, the Great Salt Lake is not a particularly desirable destination for swimming or sunbathing. It may look or sound neat from afar, but it's not so glamorous up-close and can even be downright stinky at times -all part of being a dead, inland sea. After driving almost an hour on gravel and dirt roads through pastures and over one of the bumpiest 'roads' I've ever experienced, we arrived at Rozel Point, the neck of a desolate peninsula at the north end of the lake. There's no designated parking area – just drive as far as you dare without losing your oil pan and park on the side of the road. 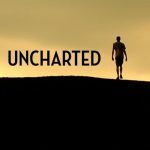 Chances are you'll be the only one out there. We got out of the car, surveyed our surroundings and stretched. It's deathly silent, only a light breeze bends the tall grass and sunflowers that grow on the sloping shoreline. We grabbed our cameras, sandals and hopped over and around the large volcanic boulders on the way down to the shore and onto the 'stem' of the giant spiral. Okay, this is impressive. Maybe even monumental. Even after all the photos I'd seen, it was a lot bigger than I expected. Wider than a road, it extends over 100 yards out into the lake before curling into a huge snail-like spiral. And if that's not unique enough, the lake in this area is not green, blue or brown. It's PINK, and it looks just like pink lemonade. No other description accurately fits. 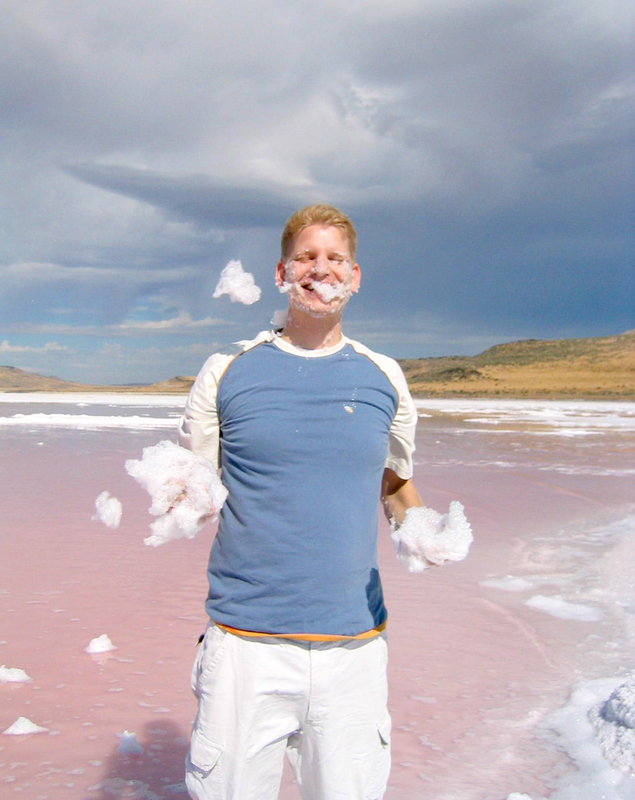 How do you get pink water? In 1959, the Southern Pacific Railroad –in an effort to reduce travel time between Chicago and San Francisco– built their tracks right through the middle of the lake. As a result, the northern half has become even saltier as the now abandoned tracks have isolated it from fresh water tributaries. 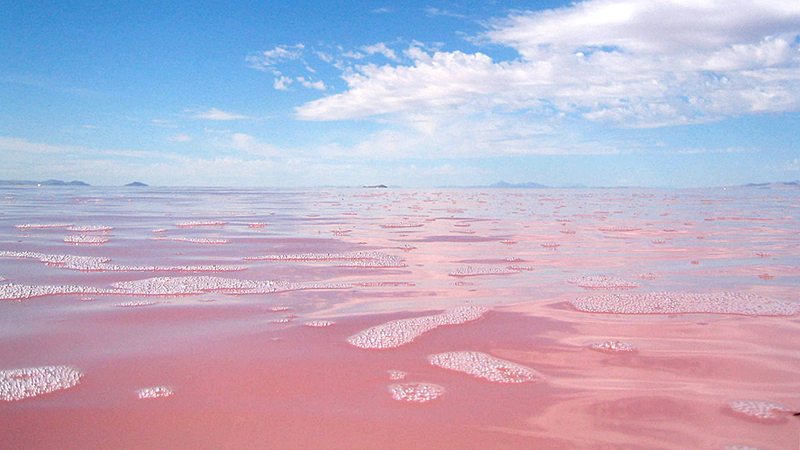 Rare salt-tolerant bacteria and algae called brine thrive in its salinity and these organisms give the water its rosy hue. 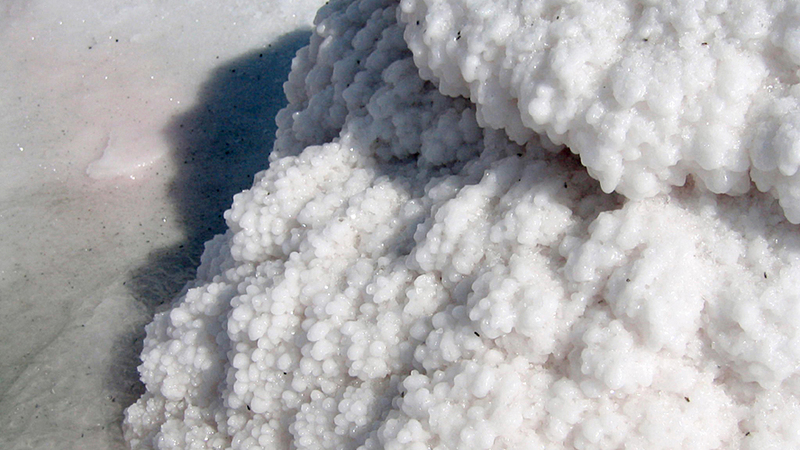 The salinity is so great, that over time, the water encrusts whatever it touches with a chunky layer of salt crystals. I walked along and examined several of the once black and porous lava rocks that make-up the Jetty. Each gleams like a giant snowball waiting to be stacked into a snowman. 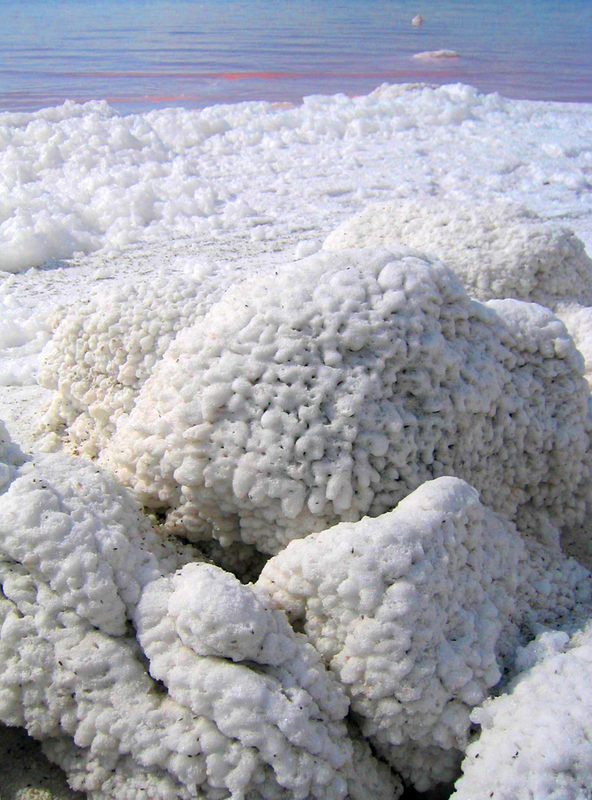 The entire surface of the Jetty is bright white and the consistency of rock salt. My confused mind kept telling me it was snow and ice, yet it was 65 degrees outside and I was wearing sandals and a T-shirt. 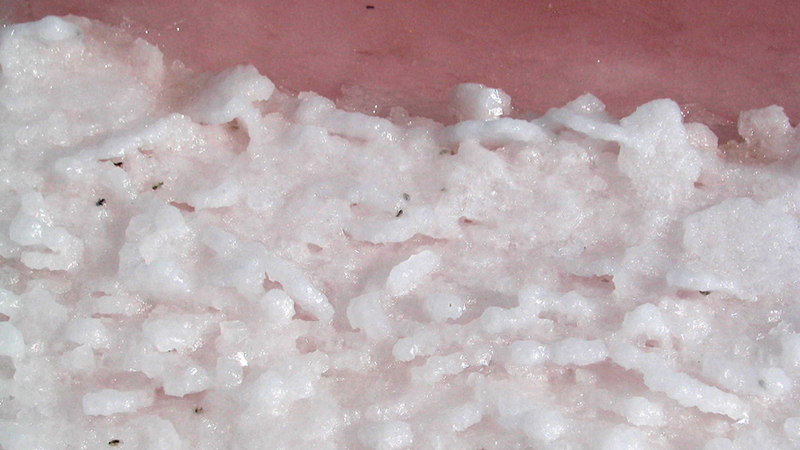 To erase any doubt, I reached down and scooped-up a handful of the chunky white stuff and probed it with my tongue. Pure salt. Incredible! 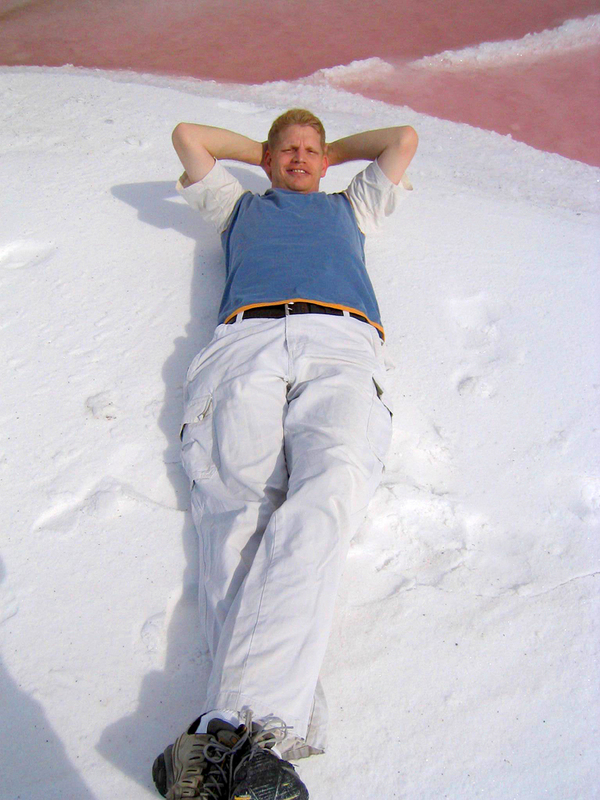 The kid in me instinctively took over as I laid on my back and made a salt angel. This place is unlike anything I had ever experienced. 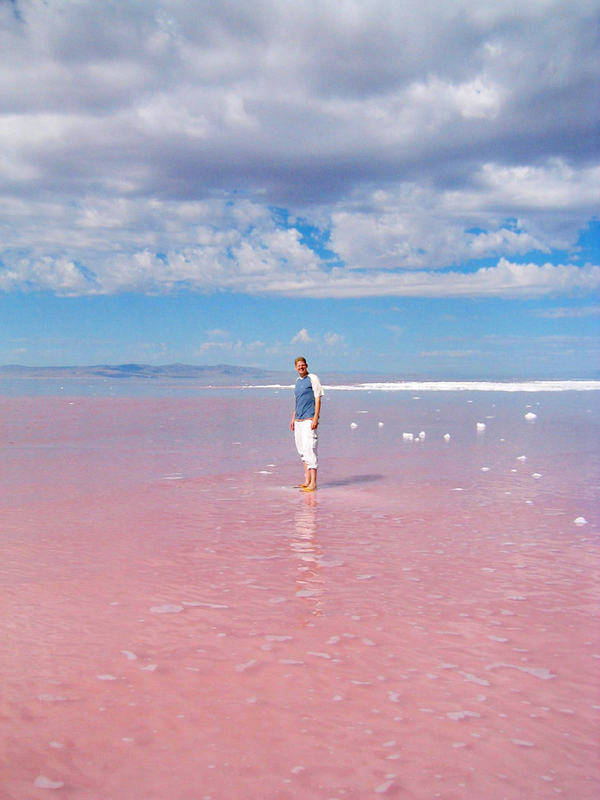 My senses were still flummoxed: I was standing on a massive, white, salt spiral floating in a vast pink sea which reflected one of the most expansive blue skies and beautiful cloudscapes I had ever seen with a ribbon of purple mountains stretched in-between. The only word that adequately describes this ethereal experience is "OTHERWORLDY" - as if I had just beamed-down to this uninhabited pastel planet from the U.S.S. Enterprise. All was quiet except for the lake gently lapping at the Jetty's edges creating frothy mounds of salty foam. So many interesting colors and textures. Suddenly, it hit me. What my friend's professor said now made sense. I was "Experiencing the Jetty." 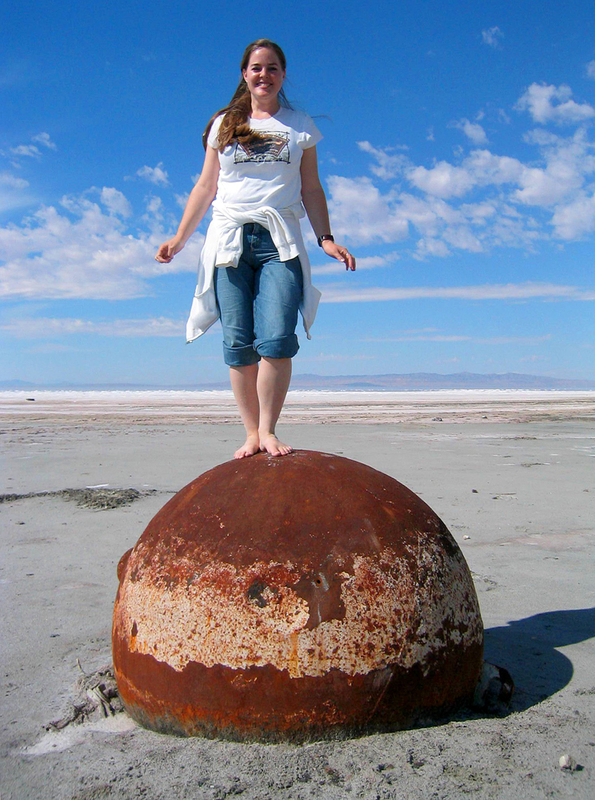 I continued winding along the salt road, taking in the view and snapping photos from every angle and appreciating the unique vision that its creator, Robert Smithson had for this remote nook of the Great Salt Lake 40 years ago. It's all about entropy. A spiraled-pile of rocks in a lake it is, but as they say, location is everything and Smithson knew that here, over time, his earth art would degenerate, collaborating with mother nature to take-on the ethereal qualities of the lake. It took him a while to explain this concept to a local contractor back in 1970, and then convince him to fulfill his vision with dozers and dump trucks. He finally did. Three days and 7,000 tons of basalt later, the Jetty curled into the lake. But now, 40 years later, it's finally complete.